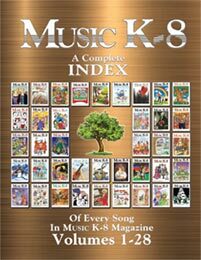 Locate almost any tune or article ever published in Music K-8 magazine! Enter as many or as few search criteria as you like, then hit "Go!" To find everything in Music K-8 magazine on a certain topic, choose a subject from the Subject menu. To search for a specific song or article, type in all or part of the title in the Song Title field. For a very focused search, enter search terms in the Song Title field and select a Subject. If you want to eliminate articles from the search, check Songs Only. To view all songs and articles in a particular issue, select the Volume and Issue numbers from their respective pulldown menus, leave the other forms blank. To view all songs and articles for an entire school year, select the Volume from the pulldown menu, leave the other forms - including the issue menu - blank. To search for recorder tunes that use specific notes, select from the Notes Used pulldown menu. If you wish, select whether you want songs that have Only these notes (fewer results) or At least these notes (more results).